Like any other business initiative, corporate mentoring programs must be planned and monitored with ROI in mind. Too many companies today aren't sure what they really want to accomplish with their mentoring programs, making them hard to measure and justify with decision makers. Mentor program managers should focus on these five steps in the planning phase to gain buy-in from stakeholders and secure a sustainable budget for mentoring. Every mentoring program needs a clear objective. Why do you have a mentoring program in the first place? What are you expecting to achieve with it? 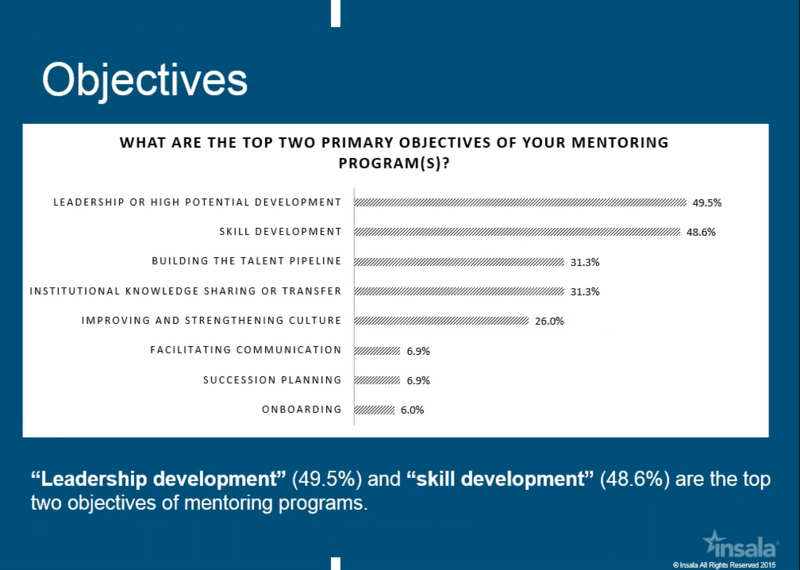 In a recent industry survey with mentoring program managers we found that the two most common objectives for corporate mentoring programs are the development of leadership and workplace skills. Your program might be focused on grooming a specific type of skill within your millennial talent pool or a leader in a particular field, building a succession pipeline or reducing turnover in a particular business unit. We are also seeing an increase in the use of mentoring programs to reduce turnover within the Sales and IT functions due to scarcity of talent resources and high costs of outside training which offer little hands on experience when compared to an internal mentoring effort. The business case and ROI when you compare the costs of mentoring vs training is clear to decision makers while “developing workplace skills” may be too qualitative to get buy-in from management. What tools are you going to use to measure success? When do you plan to hit major milestones with your mentoring program? How will you handle any obstacles or roadblocks to your original plan? Don't assume mentors and mentees will automatically fall into their roles once you get your business objectives and strategic rollout underway. Mentoring is a concept that can mean different things to different people, especially when Boomer business leaders are working with Millennials. The Harvard Business Review says that the idea of a wiser, older mentor providing guidance to a young greenhorn is as outdated as "the notion of a 50-year linear career with a single company." You can mitigate the challenges of multi-generational mentoring by making sure that participants in your mentoring program know what their individual roles are and how these roles will contribute to the success of the program at large. 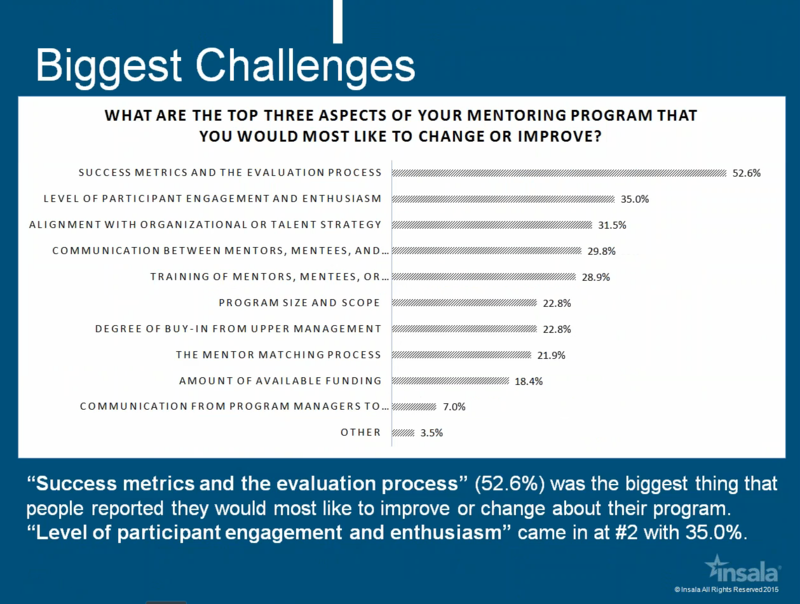 Engagement tends to be highest at the beginning of the mentoring program, but can wane as time goes on. In addition to the regular evaluations of the program that we discussed in step 2, you also need a well-defined communication plan that is segmented and tailored to mentors, mentees and most importantly the managers of your mentors and mentees. Without a defined communication plan our research has shown that engagement tends to drop around the 7 month mark! Sustained engagement has become a major trend with mentoring software solutions. According to Forrester, mentoring software helps mentors stay on track to meet their goals and makes the more tedious aspects of mentoring, such as scheduling and surveying, more efficient. As a program administrator you want to identify gaps in engagement early, so your software platform should alert you when participants fall off plan. Keep in mind that features and functions can both help and hurt the program. Simplicity is often the key to maintaining engagement with Boomers and busy sales teams. At Insala we a lot of requests from our enterprise clients to customize individual mentoring programs for the needs of the business units and functions that will be using them – keeping the critical features while removing anything that could cause confusion or frustration, especially with the older generation. It's not enough to simply collect data about your mentoring program and look at it after the fact. Where have you been successful? Whether you're communicating with stakeholders or the program participants, you must use trends in the data to guide the conversation and provoke corrective action: think like an analyst! Follow these five steps and you will be well on the way to a sustainable mentoring program. If you need more help, we have a brief eBook called “How to Build Your Mentoring Program” that can be used as a self-directed starting point to addressing your challenges. Or you can schedule a customized demonstration of Insala’s mentoring platform, tailored to your specific program and educational for all your team members.